Center for American Progress president Neera Tanden will join Nadler for the discussion. They will bring donors "up to date on where we stand in the myriad investigations into Trump's corruption and abuses of power." A Thursday morning yoga class was also added to the program, the flyer says. This is not the first time Democracy Alliance partners, who each pledge to give at least $200,000 annually to liberal organizations, have been treated with closed-door briefings from powerful members of Congress. At the group's November 2018 conference, the Washington Free Beacon revealed a partners-only briefing from Rep. Adam Schiff (D., Calif.), who was set to become House Intelligence Committee chairman. The Austin gathering is smaller than Democracy Alliance retreats in the past, with organizers deciding to hold a more "partner-centric" event, the agenda explains. "There are fewer faces around because many of you asked for the opportunity for more intimate strategic conversations with other donors, and we hope the format of this Partner-centric retreat will allow for a deeper dialogue and focused debate on the critical work that lies ahead," Democracy Alliance president Gara LaMarche and chair John Stocks explain in a welcome letter for the conference. The more critical work ahead for the donor group is defeating Trump in 2020, they explain, and also making investments to "build progressive political power and sustain it." "Our conversation here in Austin will focus on understanding the critical role that the DA must play in the short term to lay a foundation for 2020 victories and make the long-term, multi-year investments to build progressive political power and sustain it," they write. "We know that the next election is of overriding importance, so we are dedicating Thursday morning to all things 2020 and welcome policy experts and political strategists to discuss with us what it takes to defeat Trump." Additional conference materials indicate the group plans to inject nearly $300 million into liberal infrastructure to prepare for the 2020 elections. The keynote speaker at the Democracy Alliance Partner Dinner on Thursday night will be failed Florida gubernatorial candidate Andrew Gillum, described as "a long friend of the DA and one of the brightest progressive stars." Also given a platform during the conference is Virginia delegate Kathy Tran, who gained national attention earlier this year for introducing legislation that would allow abortions through the third trimester of a pregnancy. Tran will speak alongside freshman Virginia congresswoman Jennifer Wexton (D., Va.) on this year's state legislative elections in Virginia. On Friday, much of the programming is dedicated to the conference host site of Texas, with an afternoon event, "Bigger than Beto: Turning Texas Blue," moderated by DA president Gara Lamarche. Former Mexican president Vicente Fox was also spotted at the Four Seasons on Wednesday afternoon. The Democracy Alliance, formed in 2005, helps set the Democratic agenda, and its members have combined to pour south of half a billion dollars into the progressive infrastructure and liberal groups and organizations. Billionaire financier George Soros is a prominent member of the secretive group and representatives from his Open Society Foundations are on site for the group's Spring 2019 gathering. Tom Perriello, a former Virginia Democratic congressman who is now the executive director of Soros's Open Society Foundations, will brief the group on "How Big Pharma Failed America's Families." The discussion is led by the Open Society Policy Center, Soros's Washington, D.C.-based group that deals with domestic and international advocacy efforts and is a separate entity of the Open Society Foundations. Prominent Democratic politicians and figures have also been tied to the Democracy Alliance. Current presidential candidates Sen. Kamala Harris (D., Calif.) and Amy Klobuchar (D., Minn.) delivered video messages to the group during its California retreat in 2017, documents previously obtained by the Free Beacon showed. Then-minority leader Nancy Pelosi (Calif.) was on site at the same retreat to give a speech alongside Soros. Other representatives, such as Maxine Waters (Calif.), were also spotted at the resort mingling with the prominent donors. Democratic National Committee chairman Tom Perez, along with staffers of the committee, were heavily involved with the group's spring retreat in Atlanta last year. 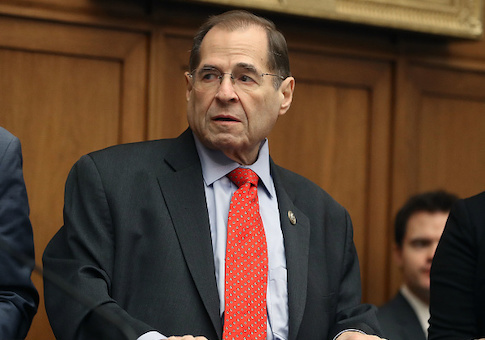 Neither Nadler nor a spokesman for the House Judiciary Committee responded to an inquiry on his donor briefing. This entry was posted in Politics and tagged Democracy Alliance, Jerrold Nadler. Bookmark the permalink.